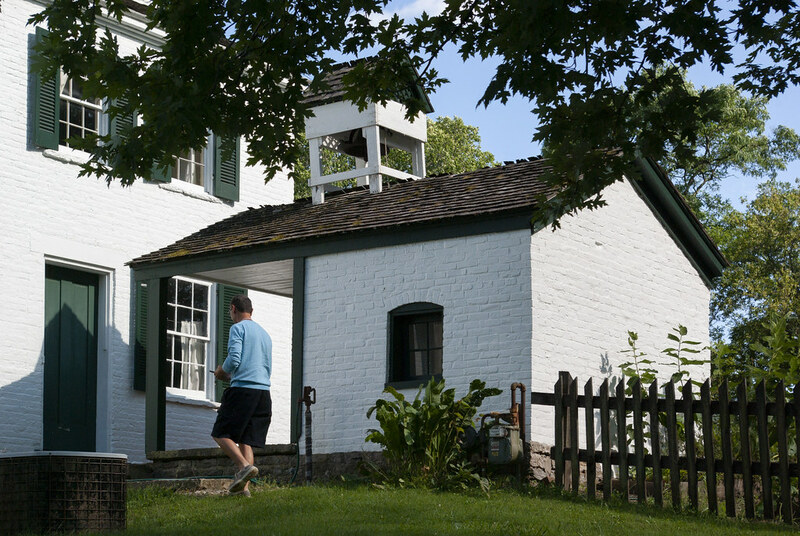 I’ve stopped by the Huddleston Farmhouse several times on my many tours across Indiana’s National Road. In case you missed it, check out the exterior and grounds here. But I never managed to stop on a day when the house was open for a tour. 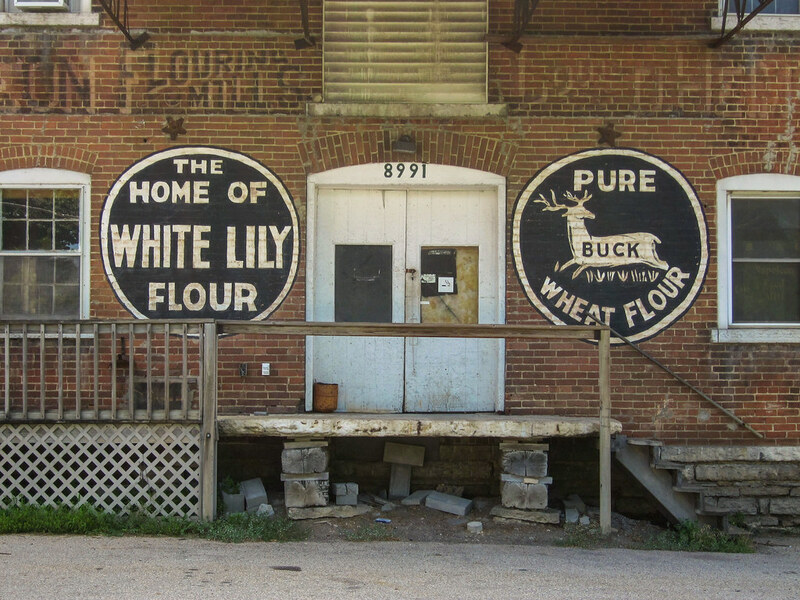 When I attended the Midwest Byways Conference in August just down the road in Richmond, hwoever, Indiana Landmarks threw the doors open wide one afternoon for us attendees. 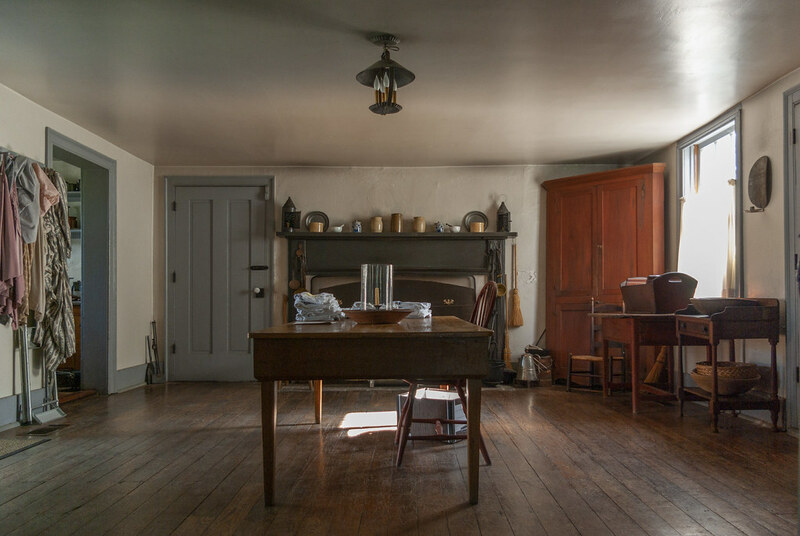 The ground floor, which used to contain three guest rooms, has been converted into an interactive educational experience about the National Road and its history. 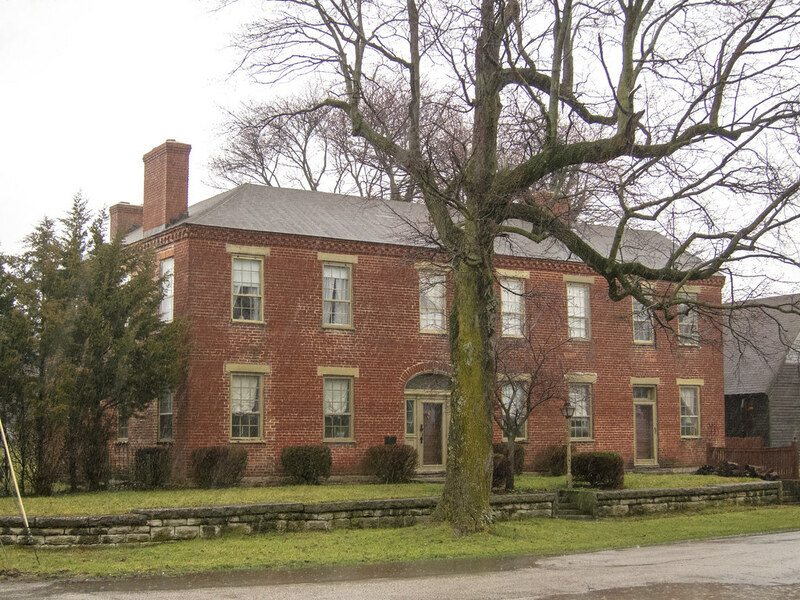 The top floor, which used to be bedrooms for the Huddleston family, is now office space for Indiana Landmarks and for the Indiana National Road Association. But the middle floor has been restored and furnished as it would have been when the Huddlestons lived here. First, the kitchen. Just off the kitchen is this dining room. 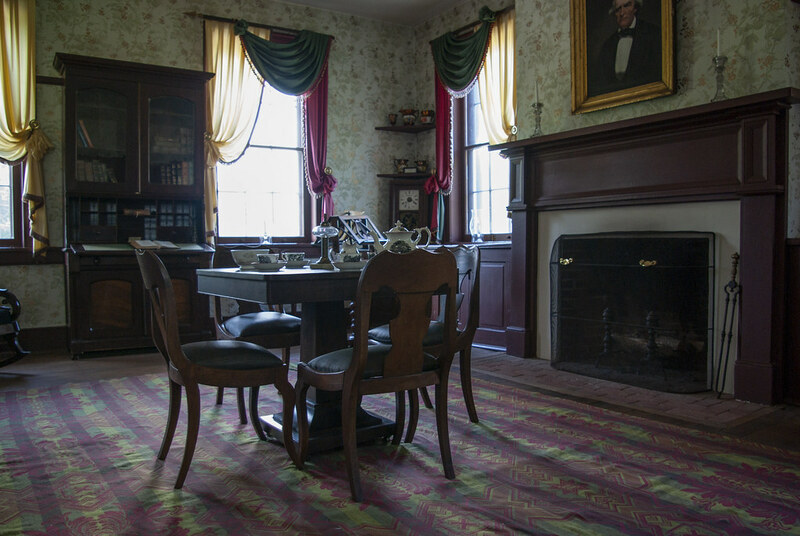 After dinner, the family would move to this room to spend the evening together. 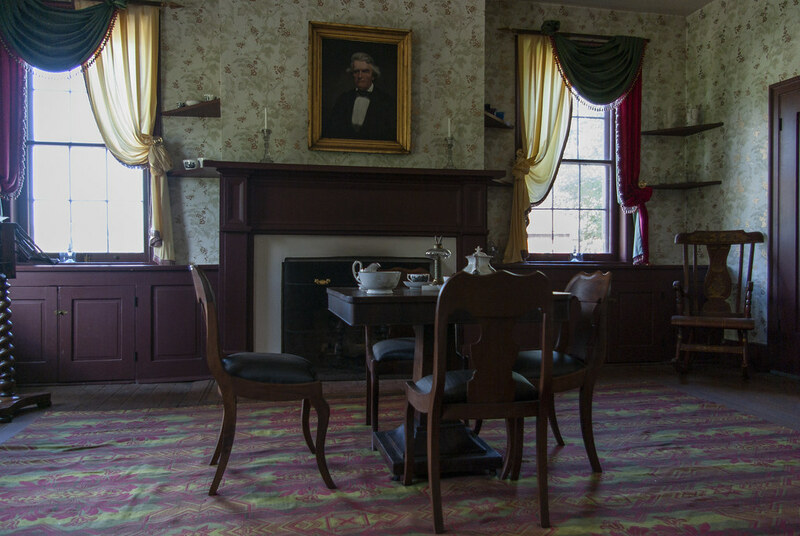 And when the Huddlestons had guests, they received them in this formal parlor. 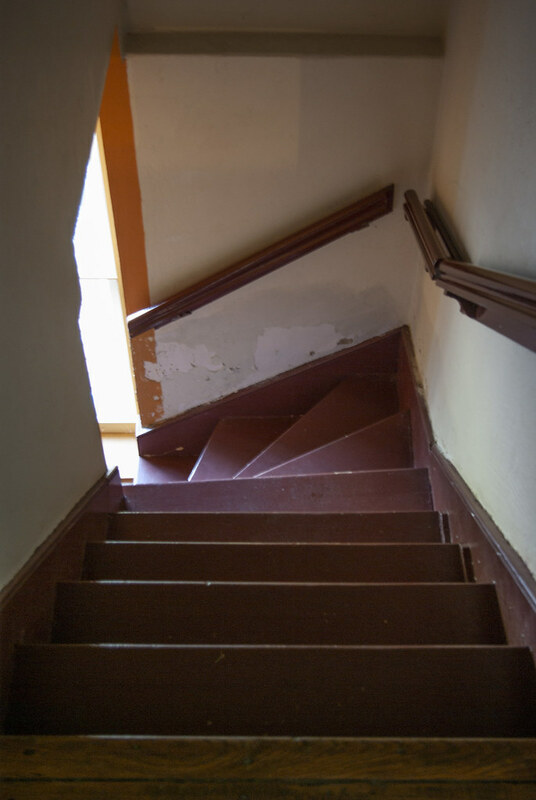 The upstairs was not open to tours as it is now office space for Indiana Landmarks and the Indiana National Road Association. But here’s the staircase up there anyway. 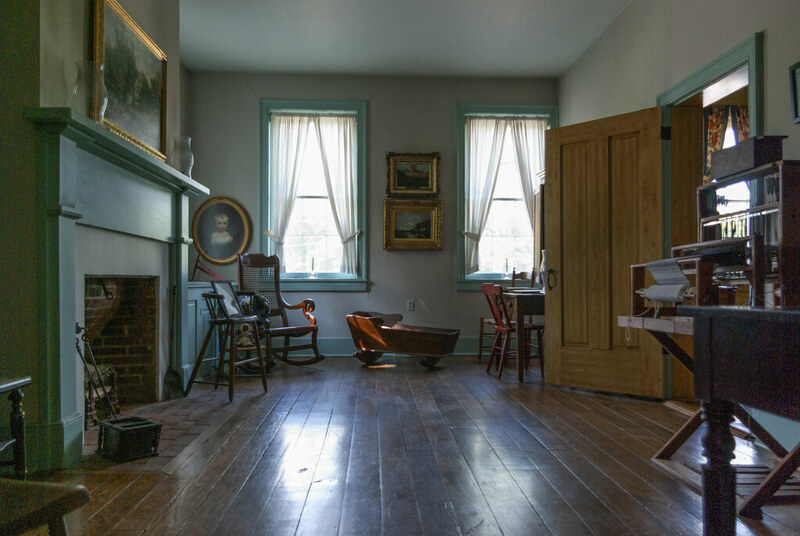 And the house’s original configuration included no stairs to the ground floor, as those were guest rooms and accessible only from the outside. 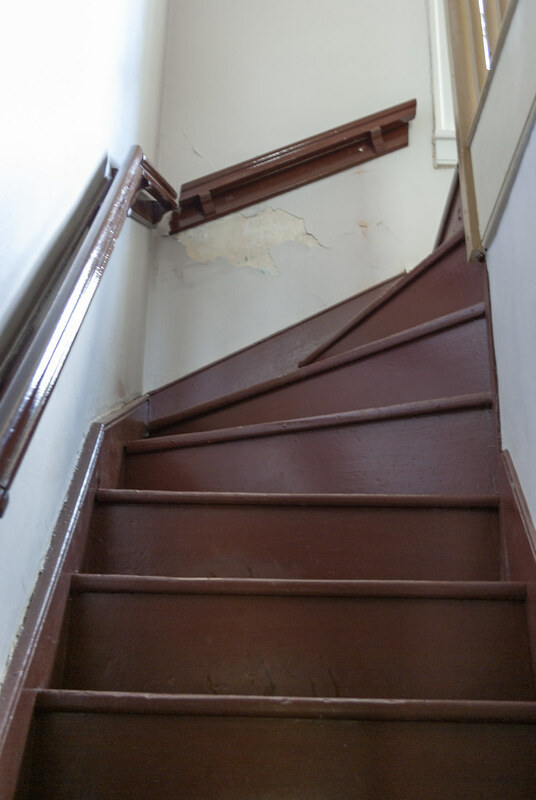 But in the restoration these stairs to those rooms were added, so that tours could visit the ground-floor National Road exhibit without having to step outside first. 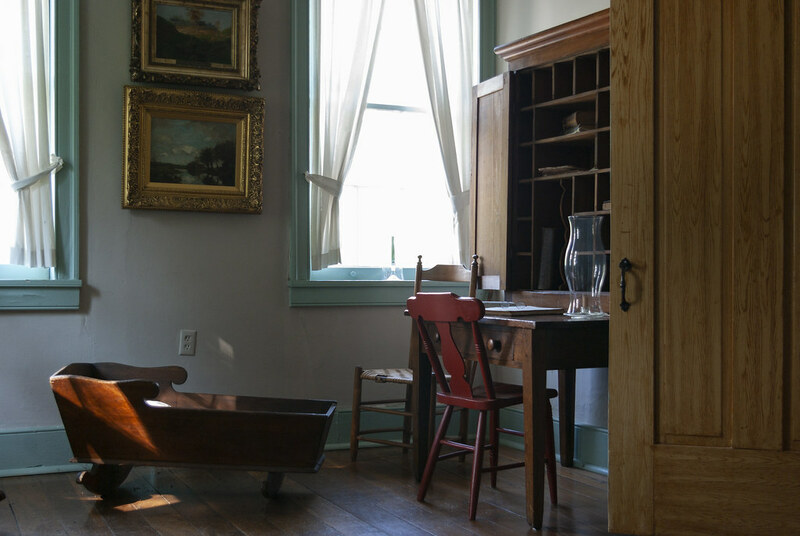 If you’d like to tour the Huddleston Farmhouse, you can make an appointment. See this page for more information. Click here to get Down the Road in your inbox or reader six days a week! It’s a commanding presence on the National Road, this, the Huddleston farm. It’s in Wayne County, between the towns of Cambridge City and Mt. Auburn, on the south side of the road. 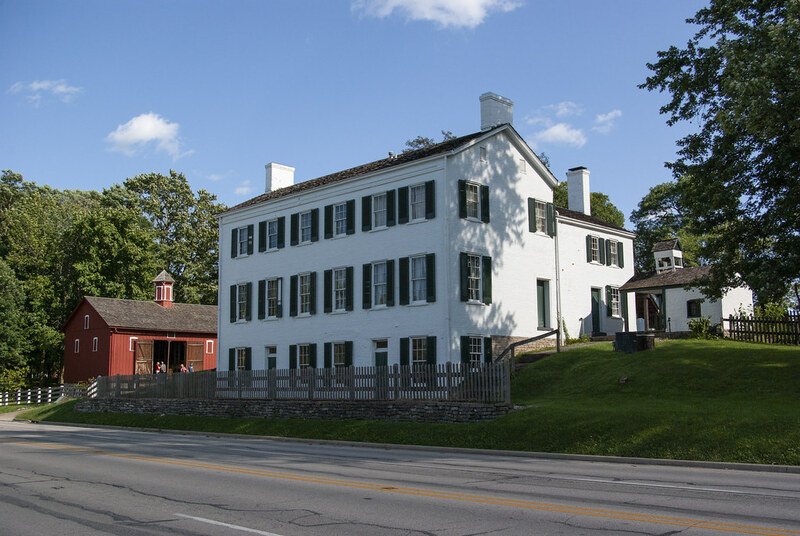 You first see the big house itself, built in 1841, as you approach along what is now US 40. It is just steps away from the road. When John Huddleston built it, the road was much narrower and so was a little farther away from the house. But the house was still plenty close to the road so travelers wouldn’t miss it, as Huddleston opened his home as an inn for travelers. He operated it with his wife Susannah and their 11 children. 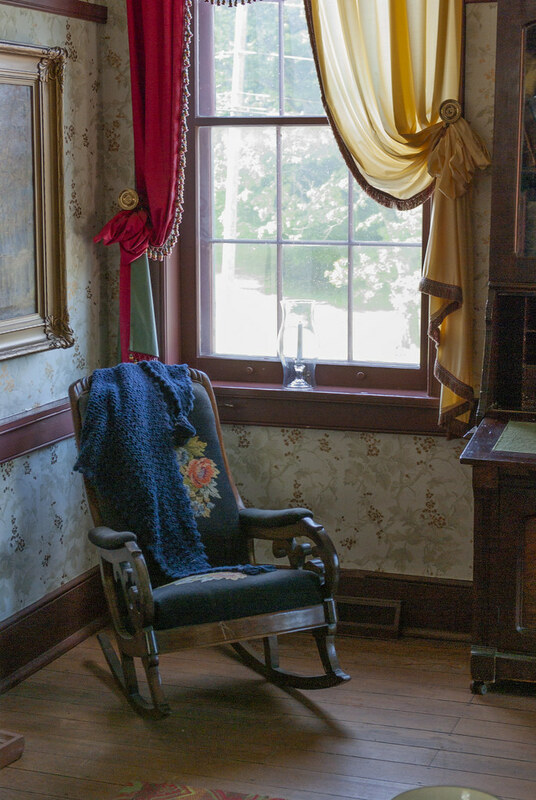 Travelers rested in the yard, on the porch, or in one of three rooms on the house’s ground floor. 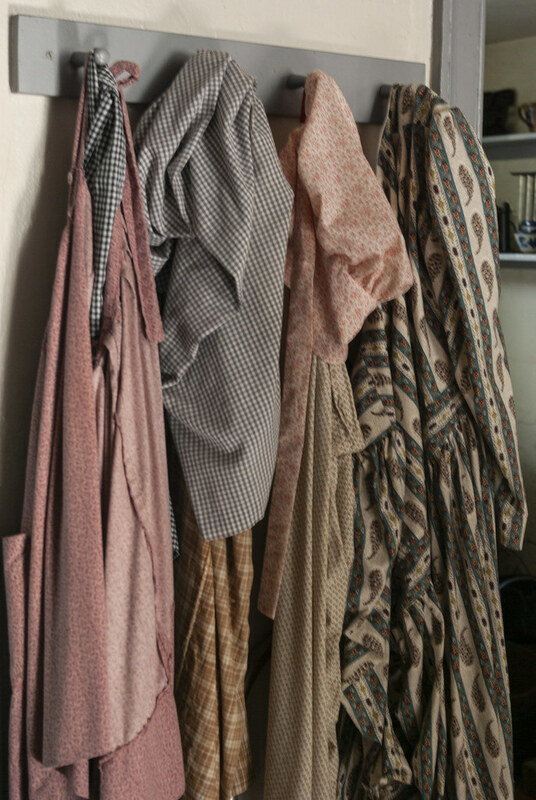 In those days, those rooms were accessible only from the outside. 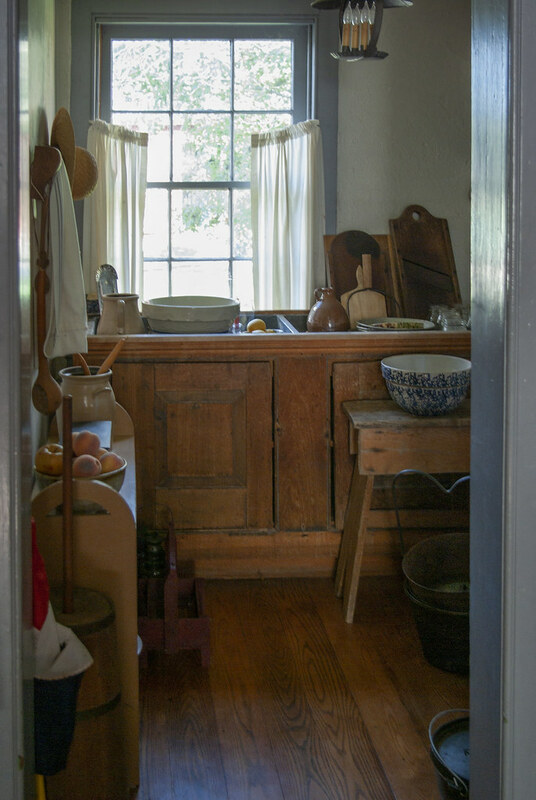 Travelers could also rent one of two kitchens, which I presume were in outbuildings. While travelers used the rooms on the ground floor, the Huddlestons lived in the upper two floors. 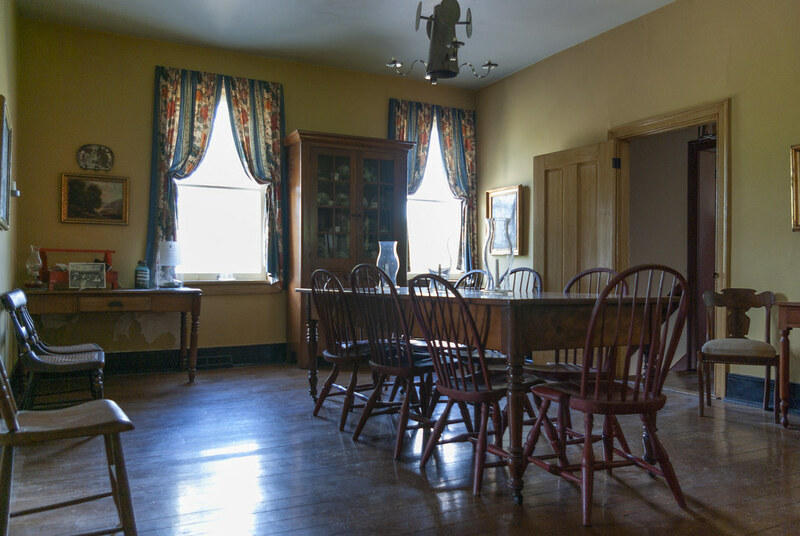 A kitchen, dining room, family room, and parlor are on the middle level, and the family slept in rooms on the upper level. Later this week I’ll share photos I took of the middle level, which is arranged and decorated with period-correct furnishings. 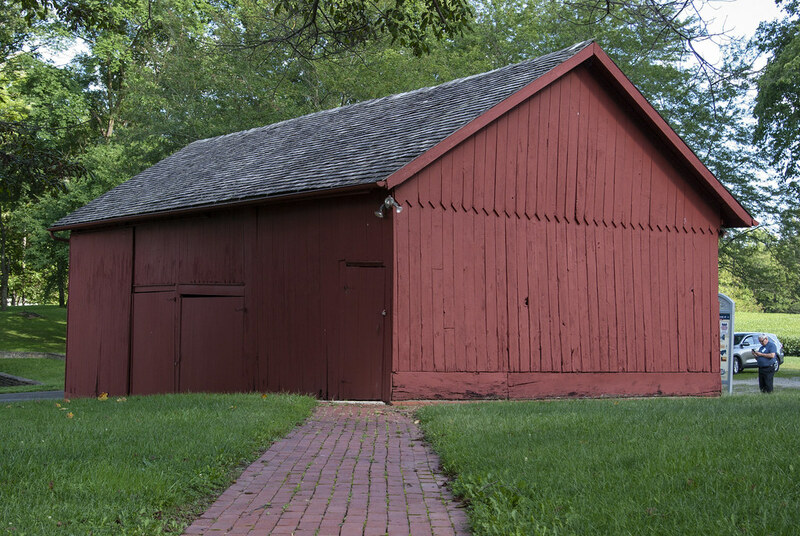 On the grounds you’ll find buildings that were a pump house, a smoke house, a large barn, and a small barn. 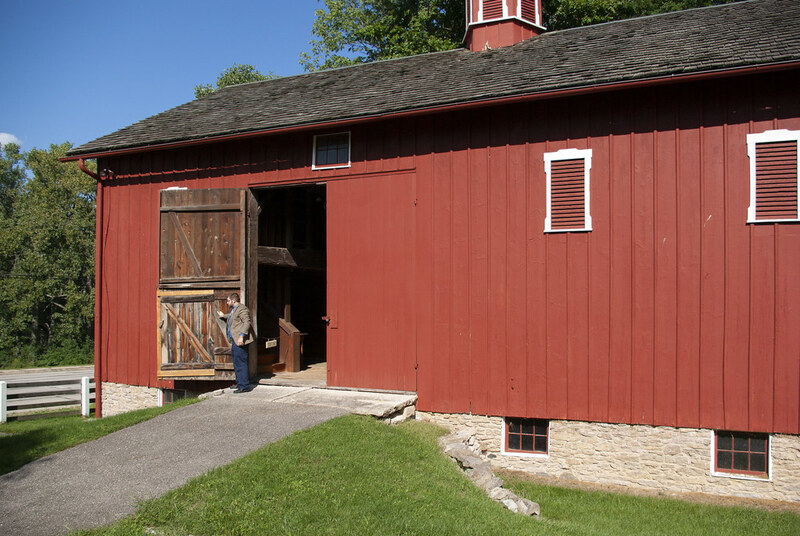 The large and small barns are the two photos above. 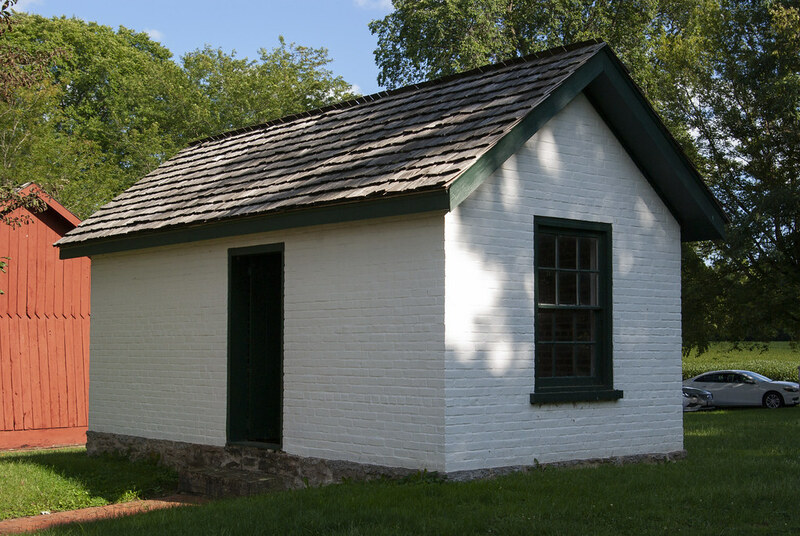 The smoke house is the photo below; it is a reproduction and the only non-original building on the property. 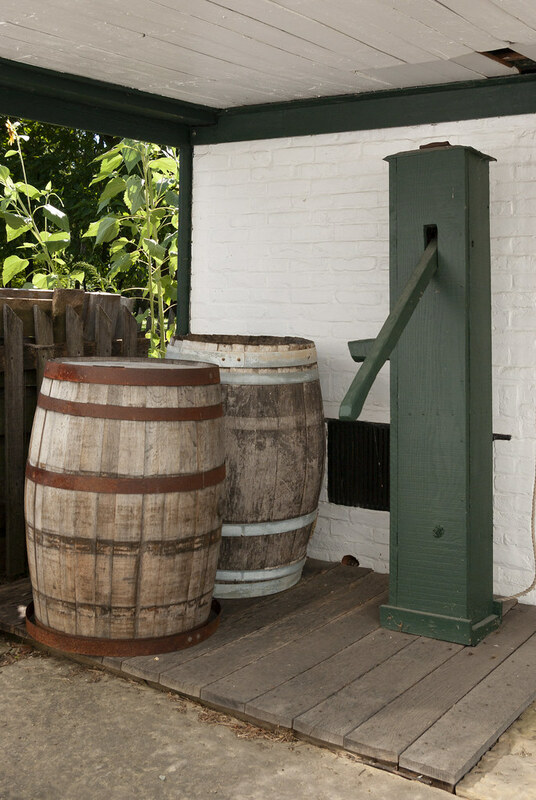 Below is the pump house, built over the well. It was just a few steps outside from the kitchen to retrieve water. That was pretty modern in 1841. 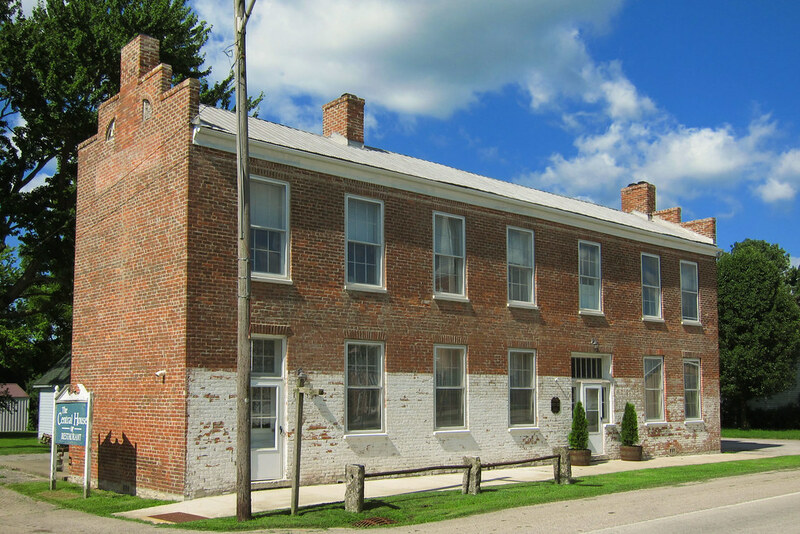 Indiana Landmarks has owned this property since 1966 and restored it in the 1970s. 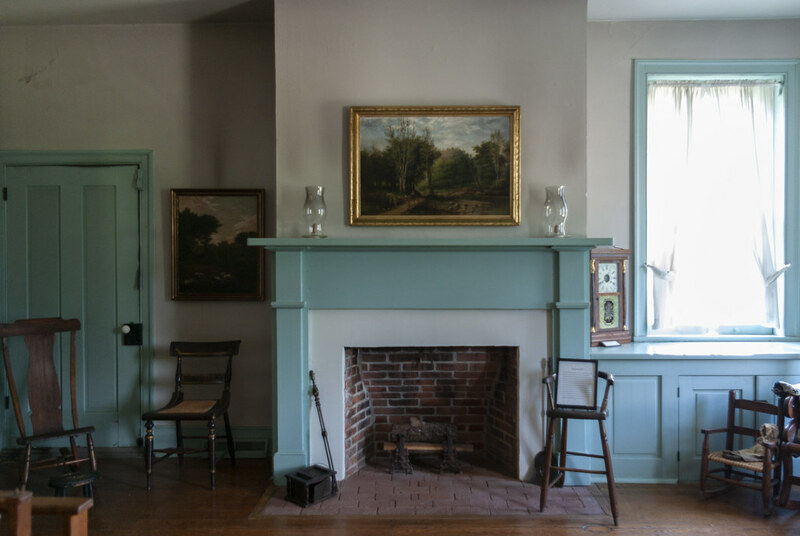 The house’s brick was originally not painted, but Landmarks painted it in the restoration. I’m not sure they’d do the same today, but the standards of preservation were different in the 1970s. Come back all week for more photos from the farm. On Thursday I’ll share photos from the interior, the middle floor, which is furnished as it might have been in the Huddlestons’ time. There’s a lot of lovely historic architecture to see in Napoleon, a small town in Ripley County, Indiana. But getting there is part of the fun: from the north or from the south, you do it on the Michigan Road. 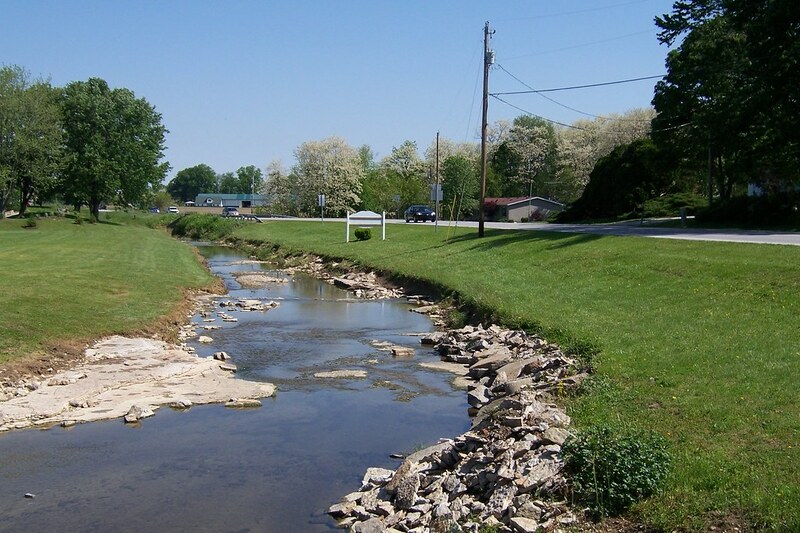 Ripley County boasts two alignments of the Michigan Road, the original and a later one that is now US 421. They come together in Napoleon. In the Michigan Road’s early days, what is now US 421 was a plank road starting in Versailles, and it became the more major route. It’s why, during the early years of the automobile, the Michigan Road was rerouted onto this road. This 1900 atlas excerpt shows where and how the two roads used to meet on the south side of Napoleon. See the two roads that merge? The Michigan Road is on the left. Each road had to cross a little stream. At some point, probably when it became clear that the old plank road would be the major route, the Michigan Road was truncated at the first county road south of Napoleon. Makes sense; why build and maintain a needless bridge? Here’s what it looks like today from above. 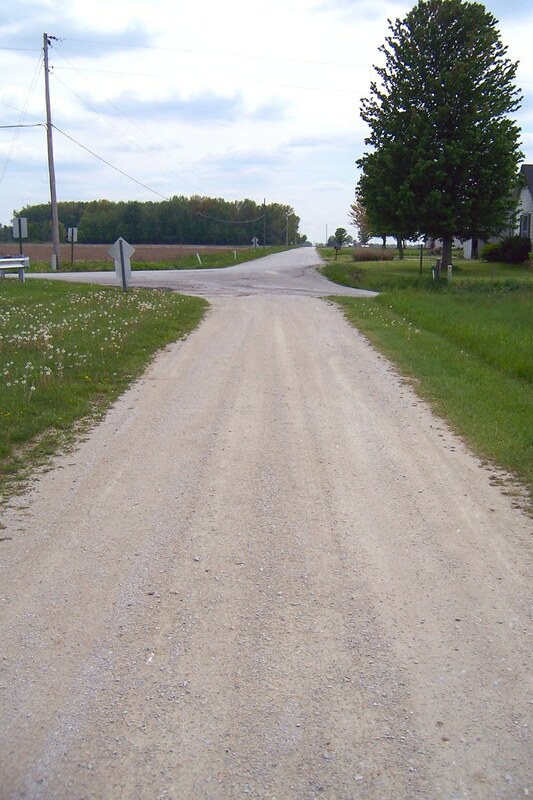 In 2008 I documented what remains of this old Michigan Road alignment. Here’s a southbound photo from north of the county road where, today, you have to turn left to reach US 421 and resume your travel on the Michigan Road. My camera malfunctioned on a northbound photo from this spot, but the road was two-track from here and it faded into the grass ahead. 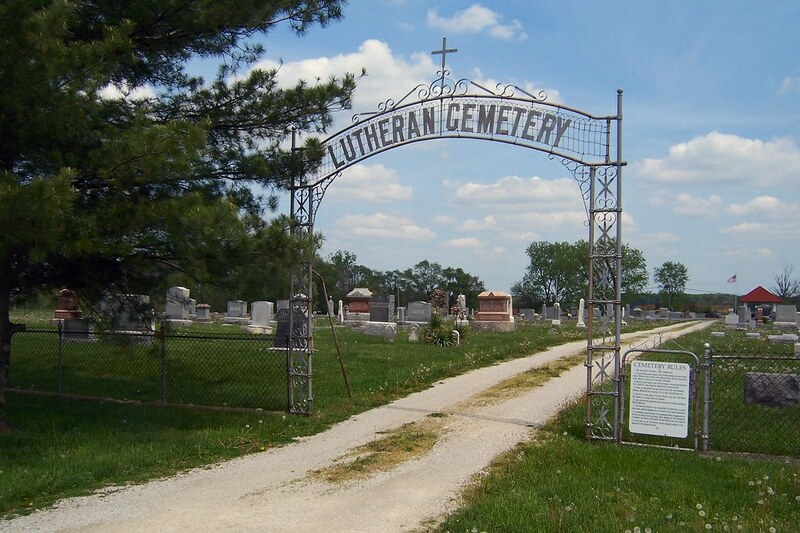 This little bit of gravel provides access to this cemetery, which is wedged between here and US 421. From my many visits to Napoleon over the years, here are a number of scenes from this little town. Its plat has hardly changed since 1900 and many buildings present then remain today. 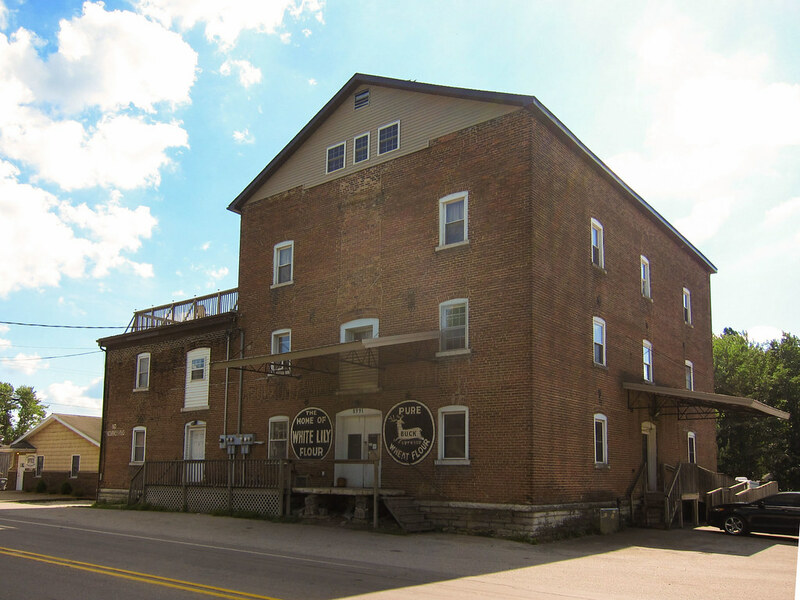 Arguably the most prominent building on the Michigan Road in Napoleon is this old flour mill. The photo above is from 2008 and the one below is from 2018. 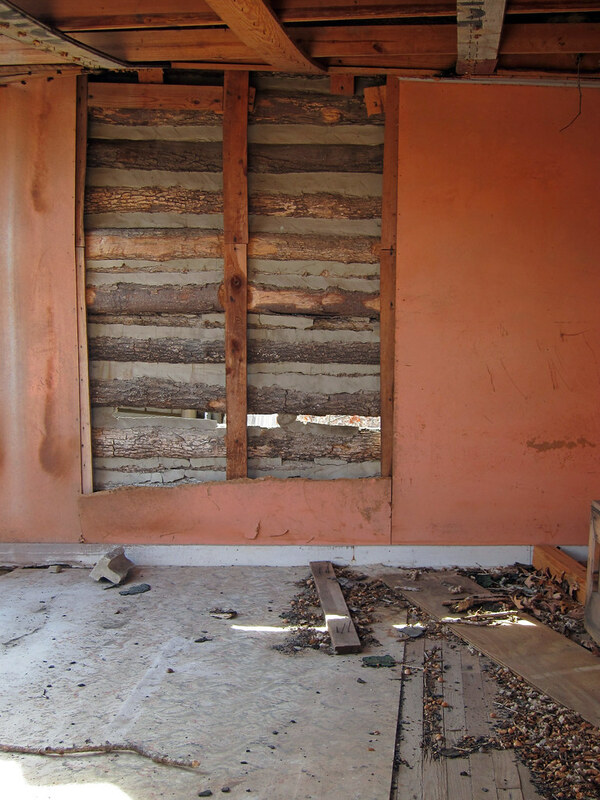 The photo below would show a building in dilapidated condition were someone not maintaining this building. I hear that this old mill has been converted into apartments. Those painted signs would be faded and chipped away if someone wasn’t keeping them touched up. The former Napoleon State Bank building is now a real-estate office. 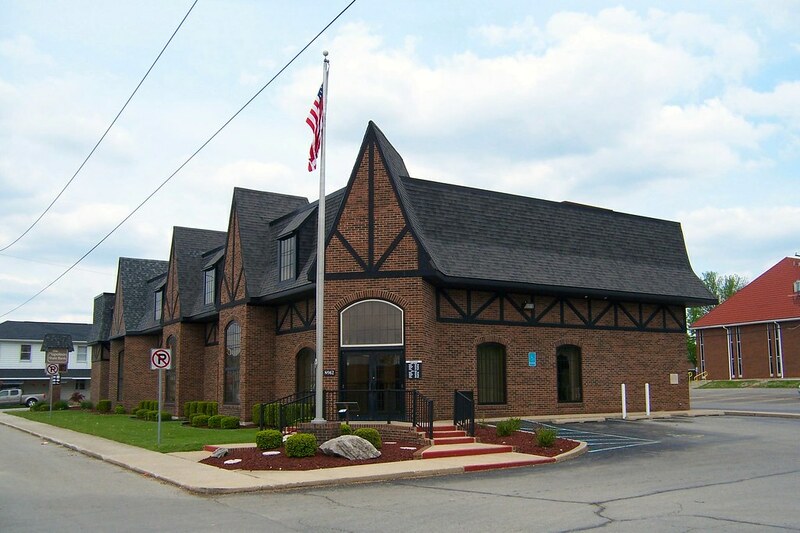 Surprisingly, the Napoleon State Bank still operates in a modern building across the street. It’s remarkable it has survived in this age of bank mergers and megabanks. 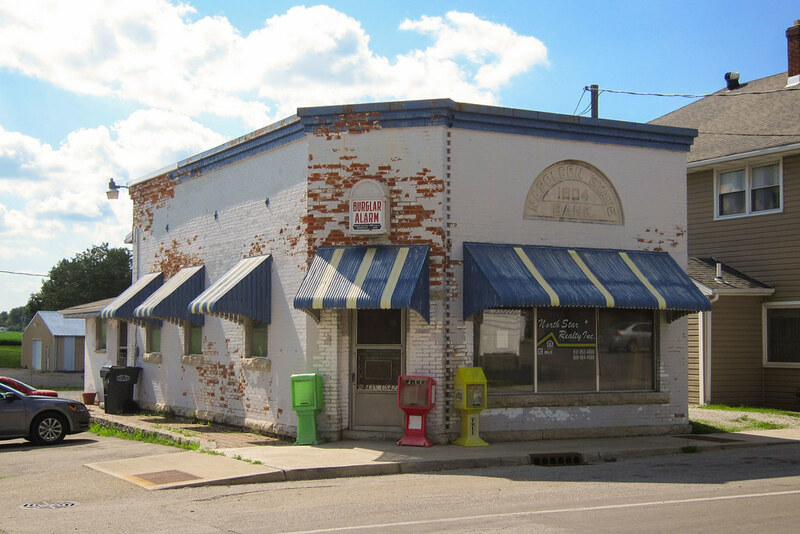 If you step off the Michigan Road and explore Napoleon’s Main Street (now State Road 229) you’ll find more lovely historic architecture. 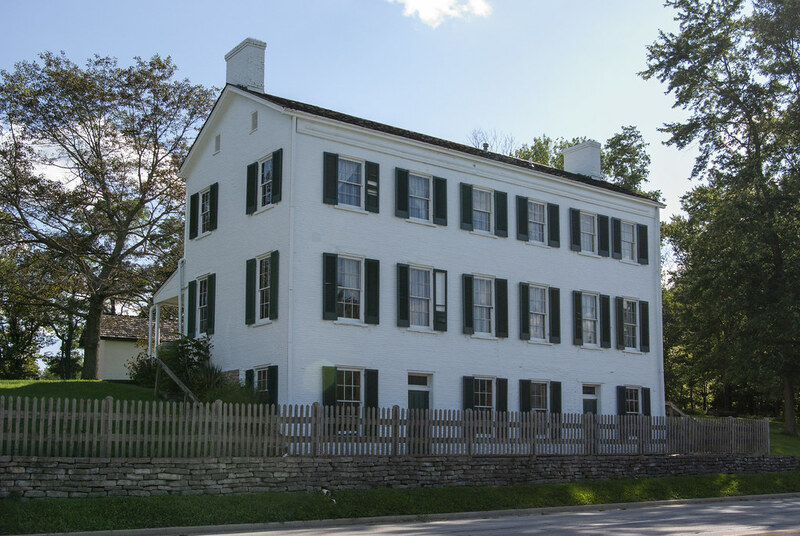 This is the Central House, built in the late 1820s. That makes it at least as old as the Michigan Road itself! 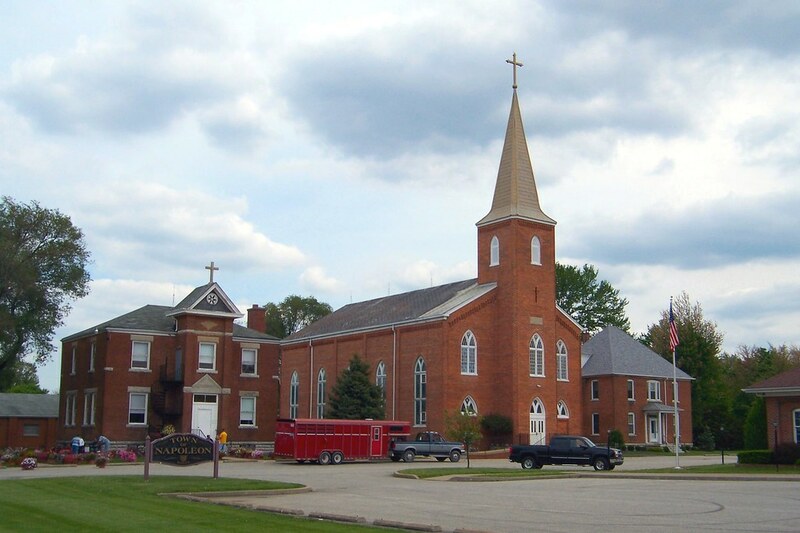 Two large churches, both probably built in the early 20th century, stand along Main Street. 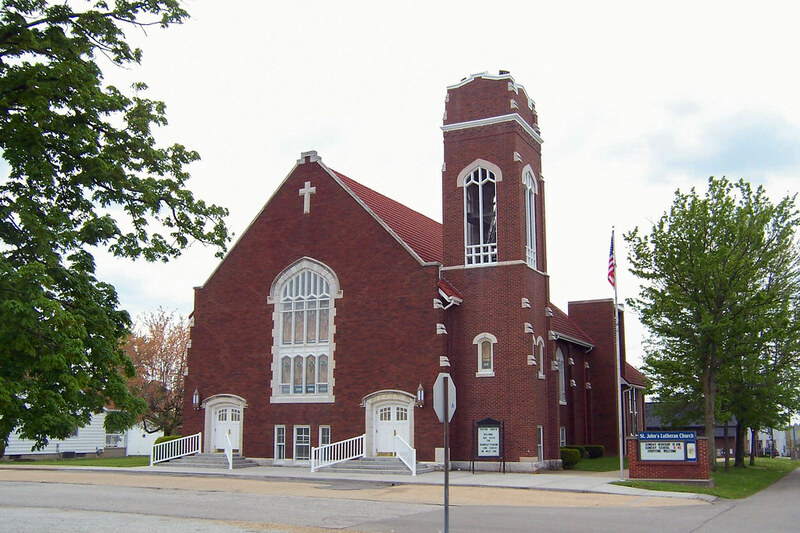 First is St. John’s Lutheran. St. Maurice Catholic is the other. Given how small this town is, these churches must have drawn members from a very large region to justify their size. Hopefully, they still do. Of all the old buildings in Napoleon, I like the onetime home of Elias Conwell the best. 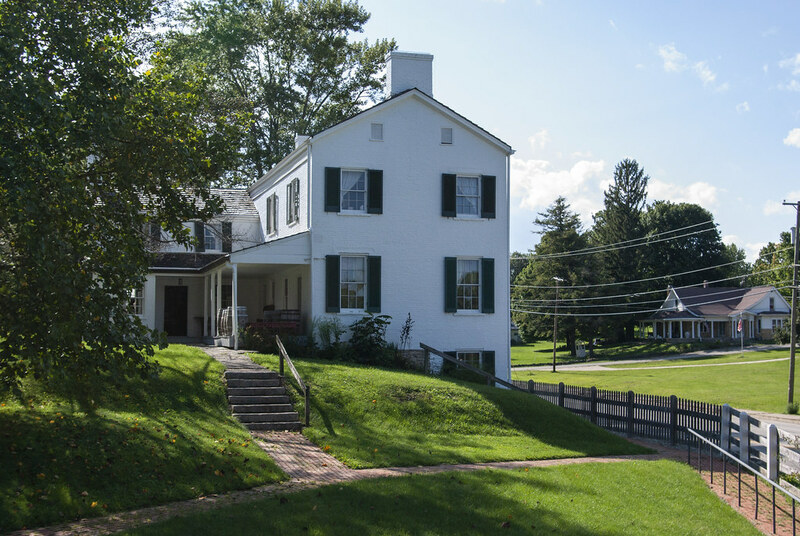 Like the Central House, it dates to the 1820s. Conwell was quite a character; I told his story here. That little creek winds all through Napoleon. Here it is on the north side of town, hugging the northbound Michigan Road. When we look back at the past, all too often it’s through rose-colored glasses. But who doesn’t like to indulge in nostalgia? I sure do. I especially enjoy photographing classic cars and reminiscing about times when they still roamed America’s roads. 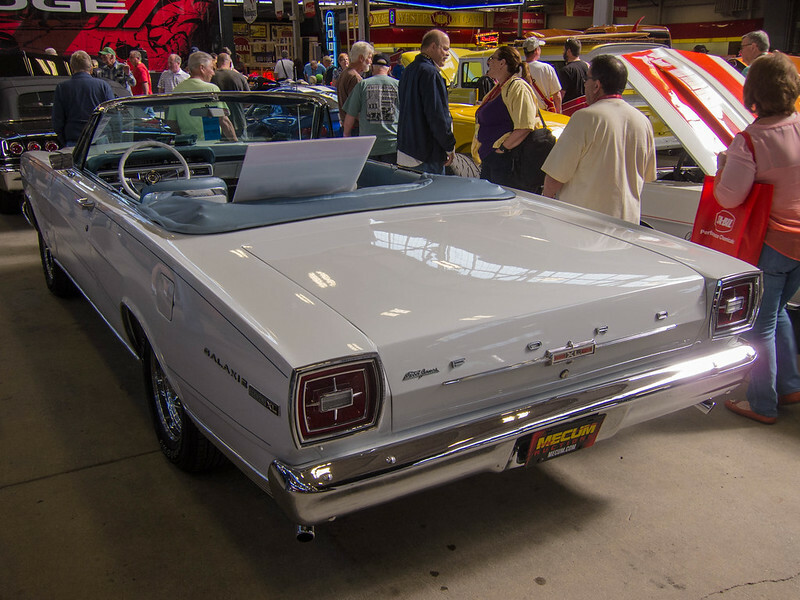 One of my favorites is the 1966 Ford, like this convertible I found at the Mecum auction in May. 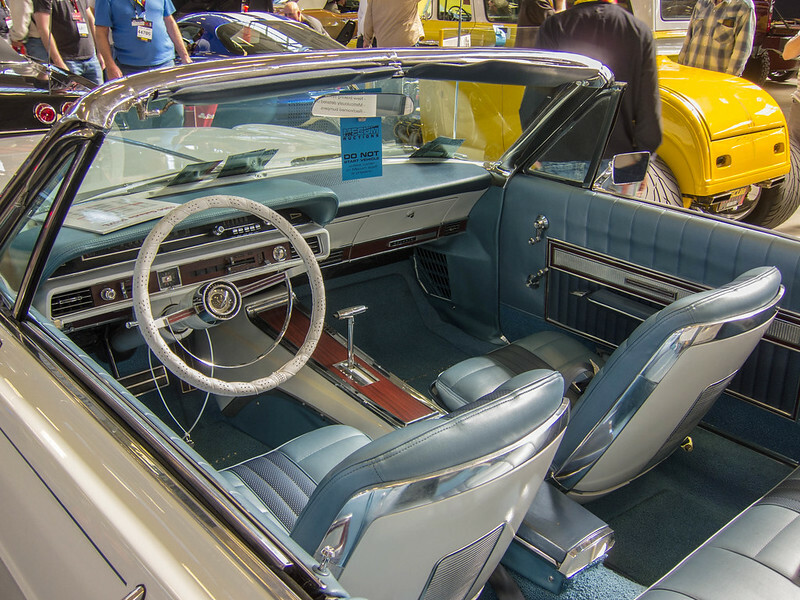 My dad owned one when I was small, a two-door hardtop. I spent many happy hours in its spacious back seat. Check out that styling! This long, low car looks so purposeful, so strong. Aren’t those tail lights just the bomb? It’s so much better looking than the tall, blobby cars they make today. And they made these cars out of heavy steel. You could sit five people on the hood of this car! Man, didn’t things just make sense back then? Today’s cars are bodied in steel so thin that if you sink your bottom onto a hood, you will dent it. But those wistful memories can’t mask the truth: you’re safer in any modern car than in this one. And it’s not just that this old Ford lacks airbags and has only lap belts. 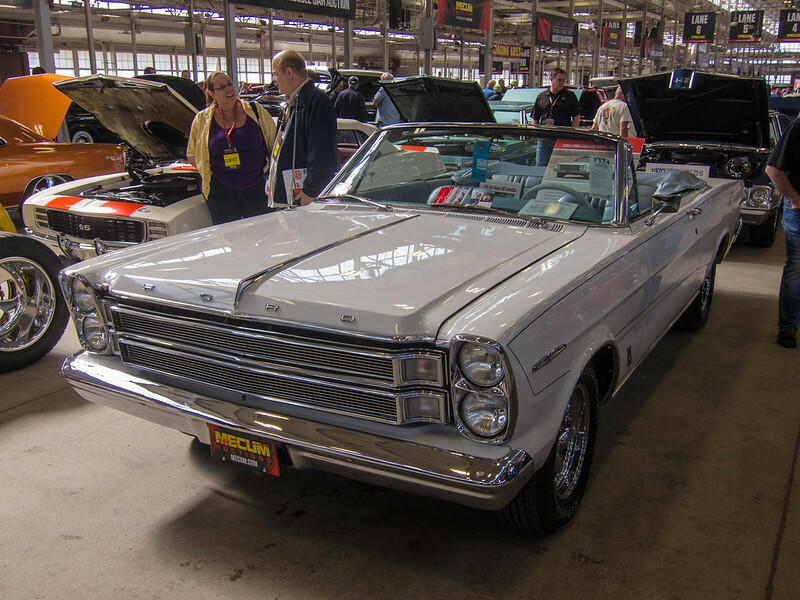 Fords of this vintage were famous for sloppy handling, making it hard to quickly steer to avoid a crash. And the brakes are drums all around, subject to fast fading during a hard stop. Oh, and see that steering wheel? It’s mounted to a rigid steering column. In a head-on crash, it becomes a missile that smashes into your face. In modern cars, that column collapses on impact. Also, in modern cars a safety cage frames the entire interior to resist crushing in a crash. That thin exterior sheet metal, along with everything else outside that safety cage, is designed to absorb impact and keep you alive and intact. If you had a serious accident in a ’66 Ford, the car would crush in, and you would absorb the impact. The safety advantages of modern cars are well documented; check out this head-on crash between a 1959 and a 2009 car to see it in action. When we look back on the past, we often fall prey to nostalgic preferences and the fading affect bias. In other words, we tend to remember the past’s good parts and forget the bad. It’s human nature to forget that in a crash, an old car like a 1966 Ford would cheerfully maim or kill you, and that far fewer people die in crashes per mile traveled today than 50 years ago. But this forgetting tends to make us think whatever bad things are happening now have sunk society to new lows. We live in a time of great national economic uncertainty, racial unrest, and global terrorism. The specter of authoritarianism and fascism has risen in this year’s Presidential election. We have a right to be worried, angry, and even afraid. But think back to any time in the past and consider national and world events then. Racial tension has always been with us and has led to violence at various times in our history. Terrorism has been going on for years, but until the last 15 years or so it was largely a problem only in the rest of the world. Our government, a magnet for narcissists, has always contained people who have committed crimes and immoral acts. And at various times in our collective memory, we’ve been at war, or in economic recession or depression. Life is like riding a roller coaster. While you’re on it, it’s scary. You don’t know what is coming: tall loops, long drops, hard turns. Yet when it’s over, we look in a new light at the parts that scared us. Retroactively, we find them to be exhilarating — or, at least for those of us who don’t enjoy roller coasters, safely completed. What was unknown is now known and our minds reframe the experience accordingly. We look upon past times like roller coasters we’ve ridden: reframed based on what we know now, viewed through nostalgic preferences and fading effect bias. We face very real perils and need to address them squarely. But perils have always existed. Now is not necessarily worse than any time in history. I suppose every American has some baggage around 9/11, even those of us hundreds or thousands of miles away. While we were in New York I couldn’t figure out how I felt about visiting the new World Trade Center and the neighboring memorial. Ambivalence gave way to curiosity, which yielded to revulsion. Then ambivalence returned and stayed. But visiting the site was on the must-do list for Margaret’s teenagers, who accompanied us. So off we went. I took just a few photos, and only these two are worth a darn. 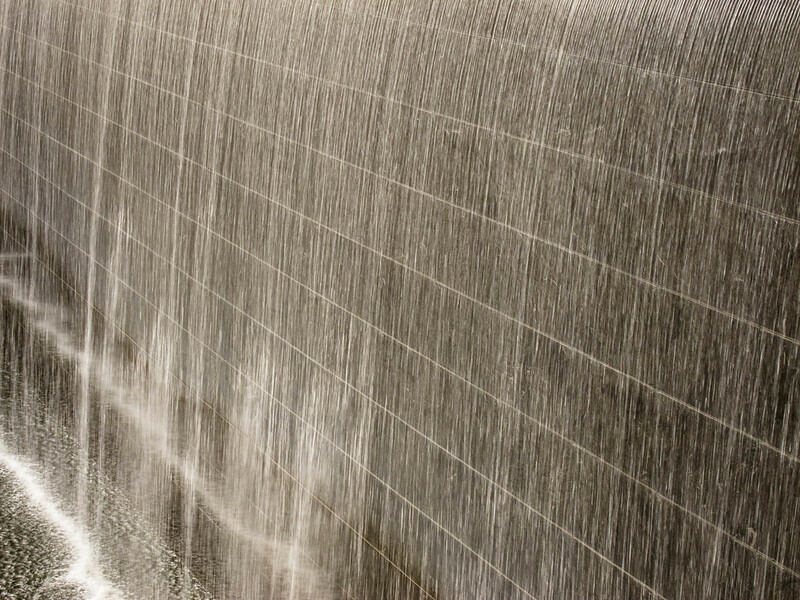 Above is the new World Trade Center, and below is the waterfall in the north pool of the memorial site directly to the south. These photos offer no connection to the place. This could be any tall building; this could be any man-made waterfall. I think it’s because I didn’t want to be connected to this place. And the memorial felt sterile to me. We walked from there a couple blocks to St. Paul’s Chapel. 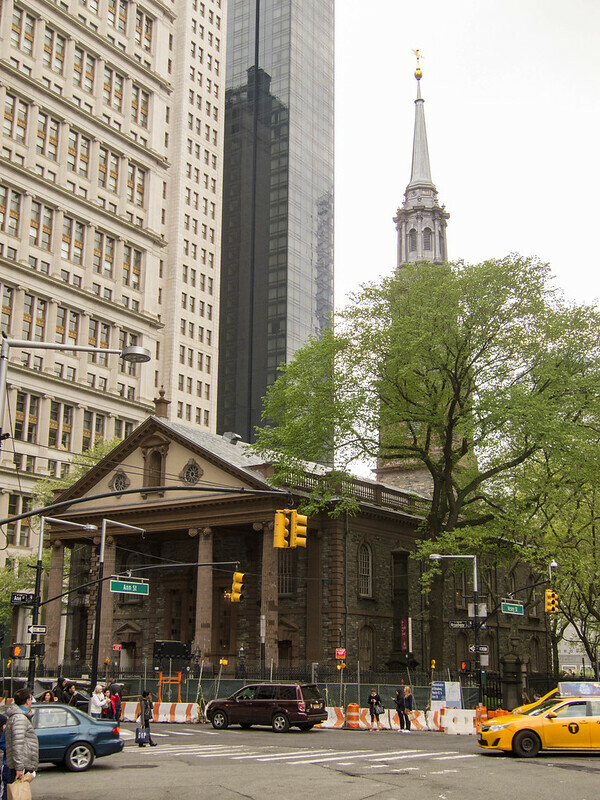 Margaret knew only that it was a 1766 church among the lower Manhattan skyscrapers, and that therefore she wanted to see it. We didn’t know its special, critical connection to the aftermath of 9/11. 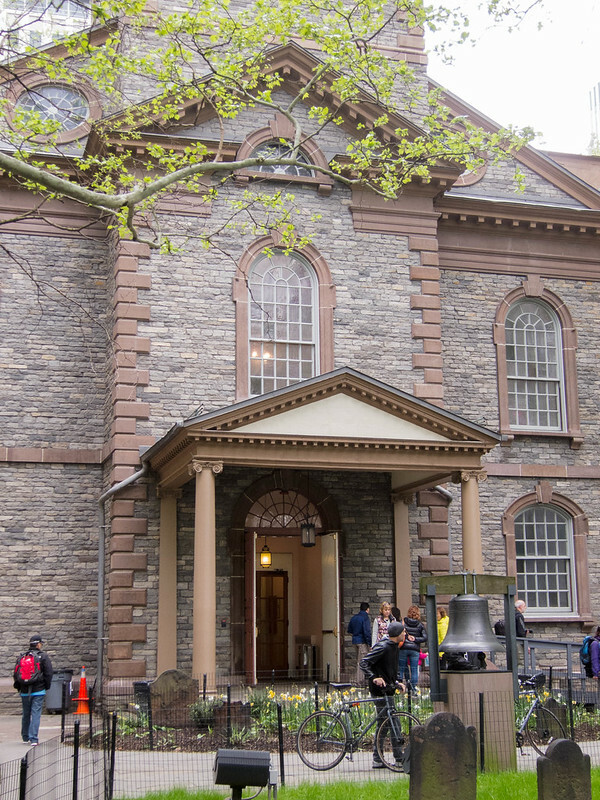 We learned that for eight months St. Paul’s Chapel was an aid and comfort station for everyone working the recovery. The building was open around the clock; volunteers fed and prayed with the workers and various doctors came to tend to their medical needs. Musicians even came to play for everyone. Despite being so close to the collapsed towers, St. Paul’s survived without even a broken window. Even though this is still a functioning church with services every Sunday, memorial panels full of photographs line the north wall inside. I wasn’t prepared for that. 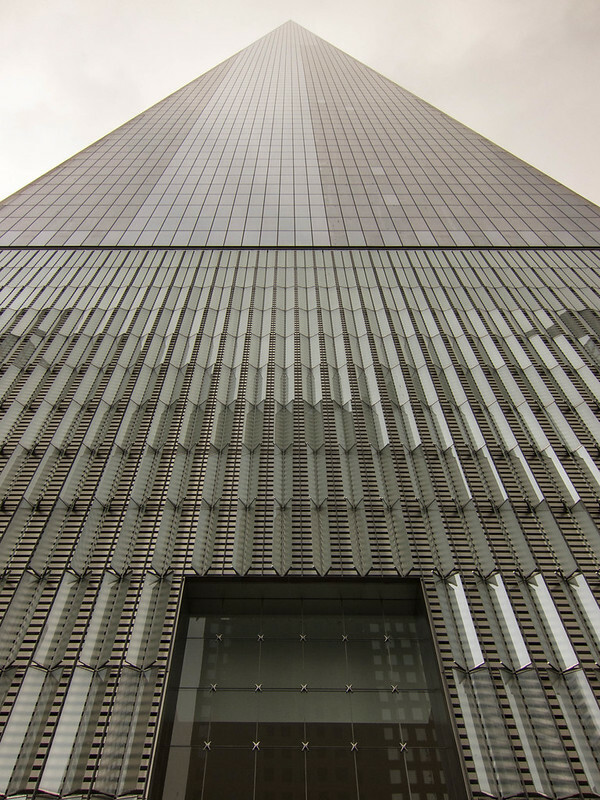 I had hoped to get away from my feelings about 9/11 by just enjoying and photographing the architecture here. 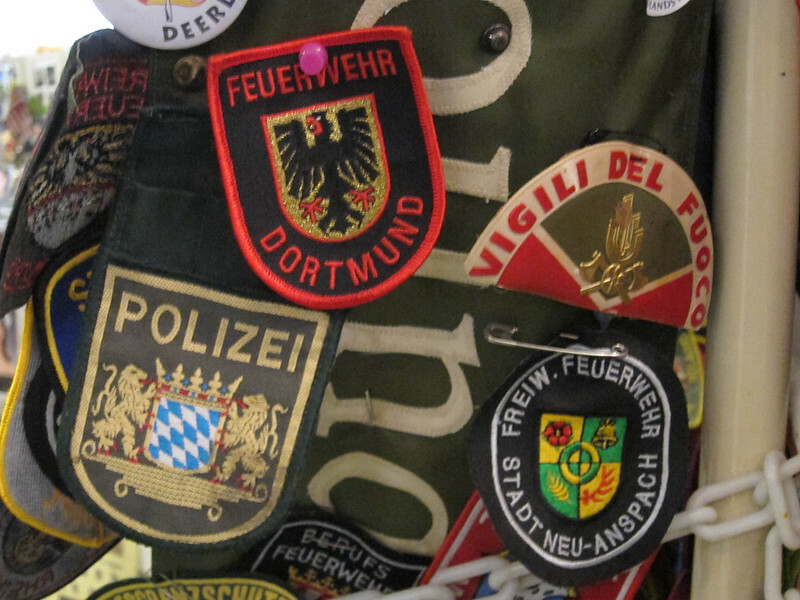 The only photos I took of the memorials are two photos of patches from police and fire forces around the world. They were sent here in a show of solidarity and mourning for their injured and dead comrades. The rest of my photographs were typical-of-me architecture shots, trying to record a solid sense of this building. Back in Indiana there are no buildings from 1766. It was a great joy to experience this one. It is a lovely church, perfectly maintained in every detail. We stepped out back and found a graveyard. In New York as in Indiana, churches used to bury their dead out back. 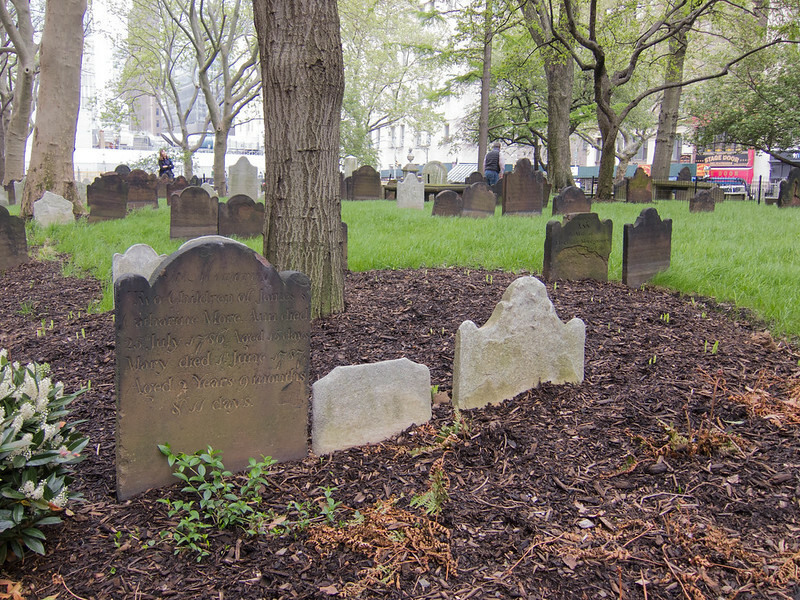 It was surreal to see these very old gravestones amid the towering buildings all around. It was even more surreal to learn that in 1766, St. Paul’s Chapel was the tallest building in the city. I loved imagining a time when that would have been true. Apparently, the church was surrounded by orchards! 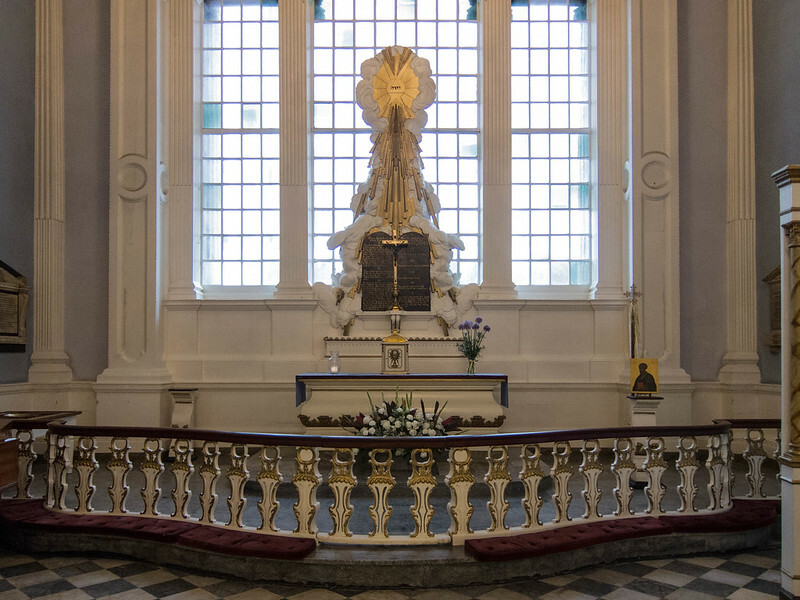 St. Paul’s Chapel is a stunning building. But I recognized that because I couldn’t escape 9/11 here, I wasn’t connecting to it in the ways I normally would. And then I came upon the bell. 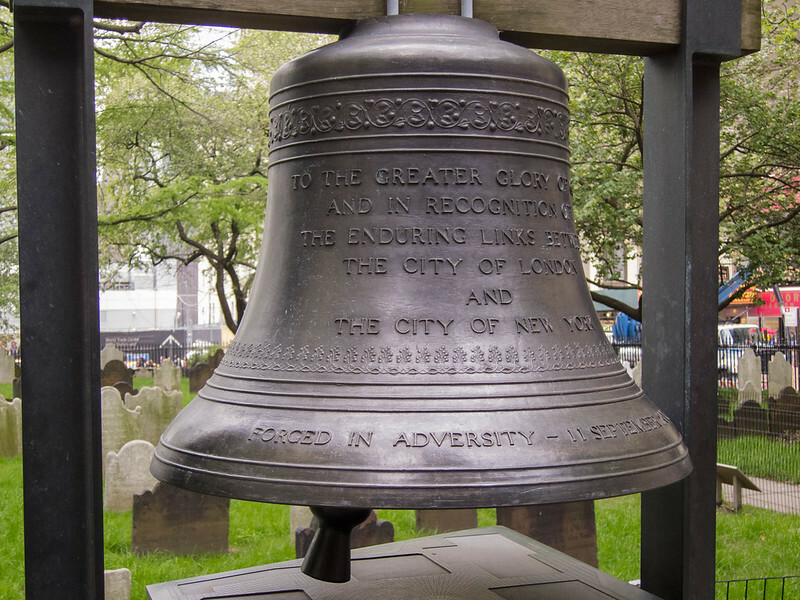 It was a gift from the city of London to the city of New York after the attack, a symbol of friendship and solidarity across the oceans. This is where it all connected for me: this tragedy had worldwide reach, and it affected everyone who heard of it. There’s no shame that my feelings about 9/11 remain unsettled, uncertain. I cried here for a minute, quietly. I shot my Canon S95 raw, which meant a lot of post-processing in Photoshop when I got home. It takes a little time to tweak each photograph for its best look. It gave me time to process not only my feelings about our visit to these sites but also more of my feelings about 9/11 itself. While processing photos, I slowly reviewed the day and thought about each scene, including those I didn’t photograph. That time and space to think, alone in my quiet home office, let me find a little more peace. One photograph I didn’t take was of one of the pews. 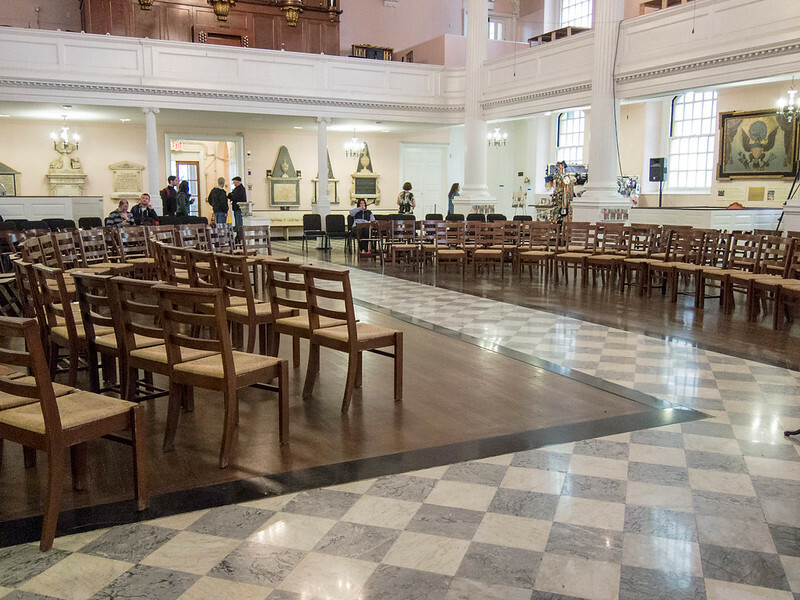 A few years ago St. Paul’s removed most of its pews, replacing them with individual chairs arranged in a U. But a couple pews remained in the back. In this church so perfectly maintained, the pews were gashed and gouged and chewed up — by the heavy shoes and gear of the recovery workers who rested on them. These pews remain as a memorial. It was emotionally difficult to follow the news stories of the recovery work in the months following the attack. I dealt with it by dissociating from it. But seeing those gouged pews made those people and their experiences real. And so I don’t need a photograph of those pews; I’ll never forget them. Canon PowerShot S95, shot raw, processed in Photoshop.